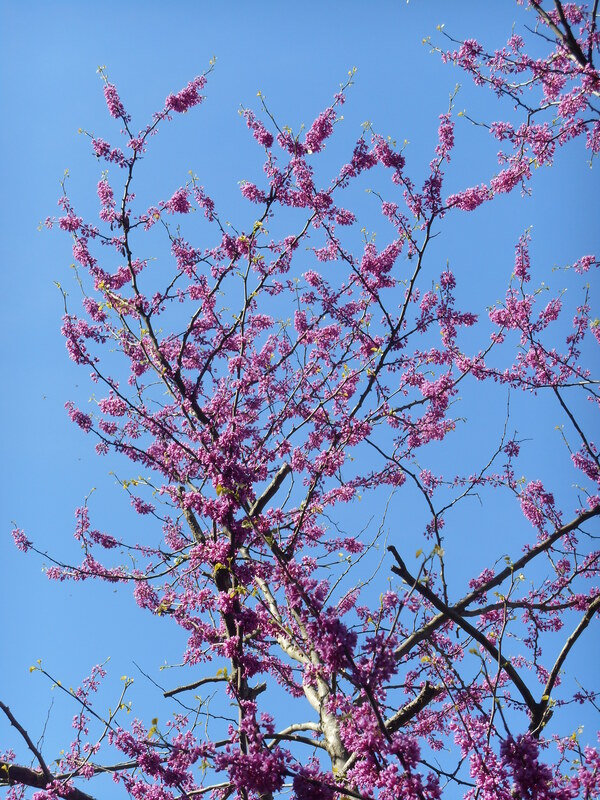 A redbud tree in full bloom grabs my attention like no other spring blooming tree. They just light up suddenly, like a neon beacon in the edge of the tree line; transforming from non-descript to gorgeous in the space of a day. 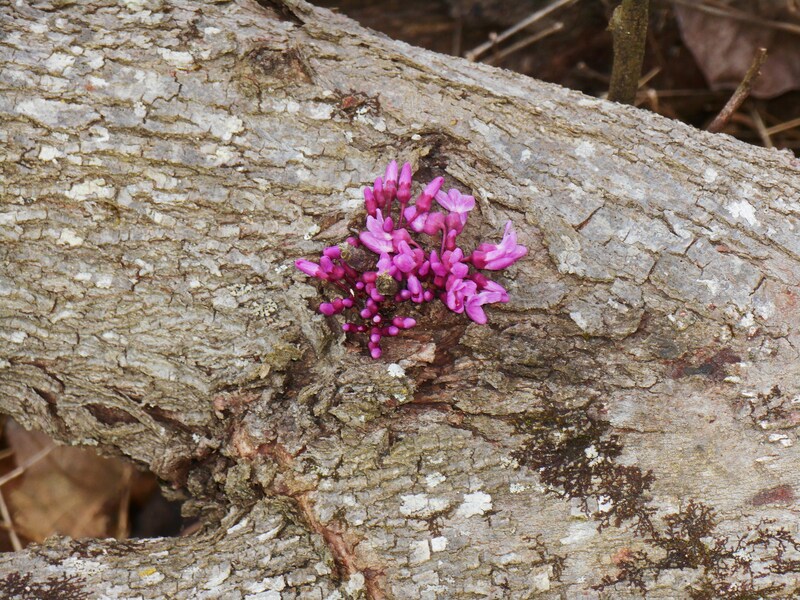 This North American native, Cercis canadensis, grows wild in our woods. Although there are a few cultivars available, including a white variety, the species pleases me just fine. 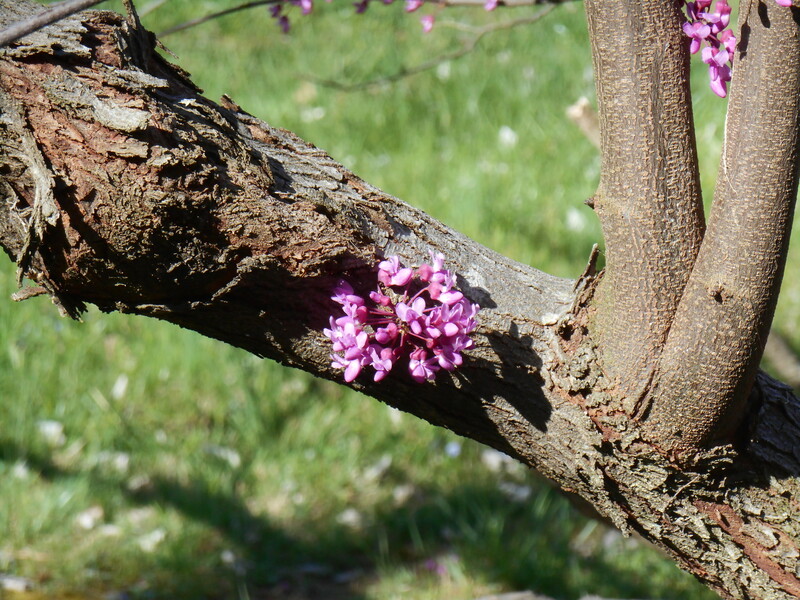 And unlike many of the spring blooming fruit trees which show visible buds for weeks, waiting for the winter to pass; the blossoms of a redbud tree simply break directly out of the bark, anywhere and everywhere. It is an amazing sight to see in early spring. Never particularly large, these trees survive to an advanced age. And as they age, they keep growing and blooming year to year despite all manner of scars, injuries, and chaotic growth. They have that courageous spirit of perseverance which expresses the heart and soul of springtime’s beauty. 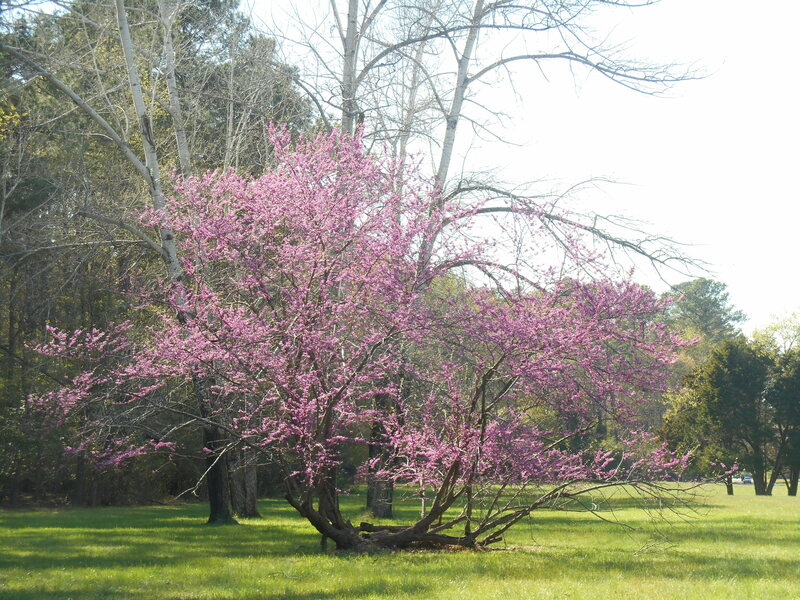 The redbud remains a quintessentially American tree. They grow from The Hudson Bay south to the Gulf coast in eastern North America. I’ve grown up loving them every spring of my life, save one when I was in Europe in April and missed them. They bloom soon after the Forsythia each year, but several days before the Dogwood’s buds open. Their flowers appear days before their leaves. They bloom when the forest remains mostly bare, with just a hint of green haze as the leaves of larger trees break bud. Their flowers feed bees and other nectar loving insects in early spring when there are few flowers in bloom. 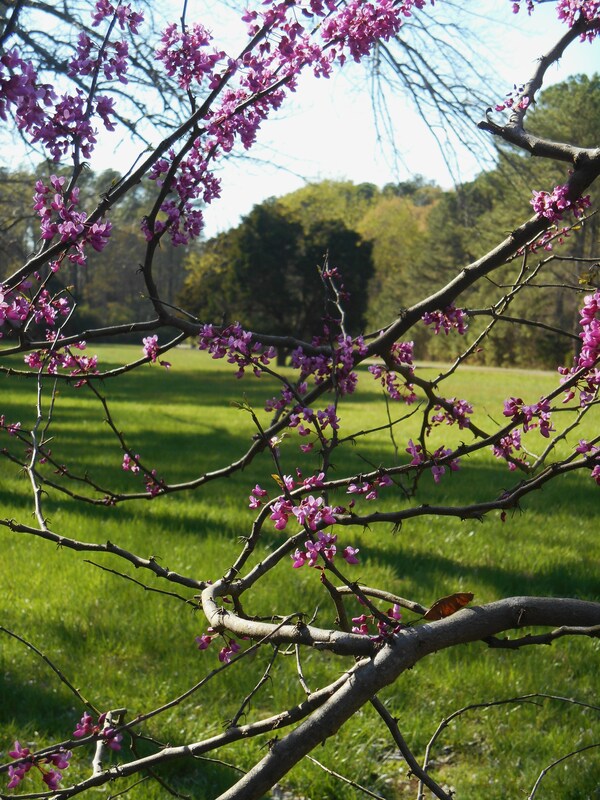 Mature redbud trees may grow wider than they grow tall. 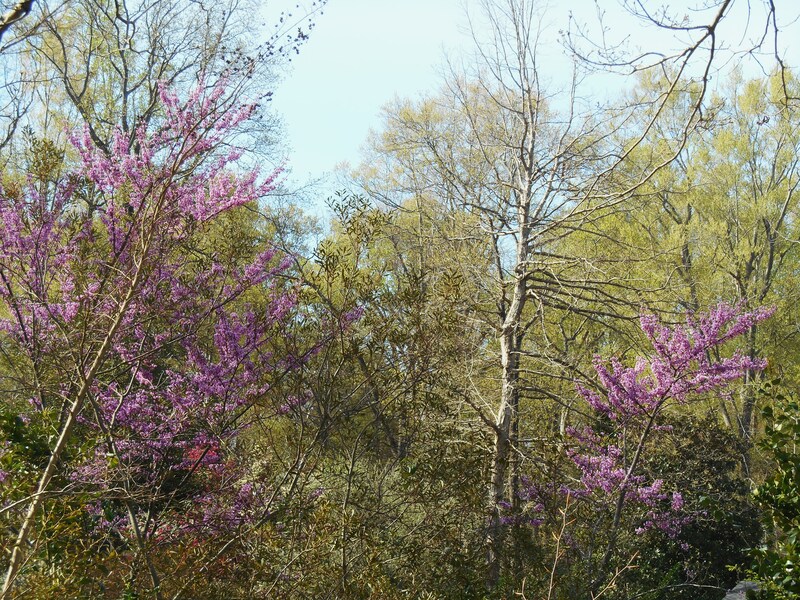 Never growing more than 20 to 30 feet, redbud remains an understory tree, growing in the partial shade of the forest’s edge and around homes. After their flowers fade, beautiful heart shaped leaves appear, followed by seed pods which look like Asian pea pods. The leaves turn gold in autumn before they fall. Every flower, once pollinated, forms a seed pod. You can imagine that in a few months time the pods hang thickly from the branches. And every pod contains several seeds, tasty to wildlife. So many seeds form, that many survive to germinate. The trees grow very quickly. They shoot up in just a few years to get their branches high enough to catch the sunlight through the surrounding growth. Slowly, they begin to fill out their rounded canopies as the years go by. 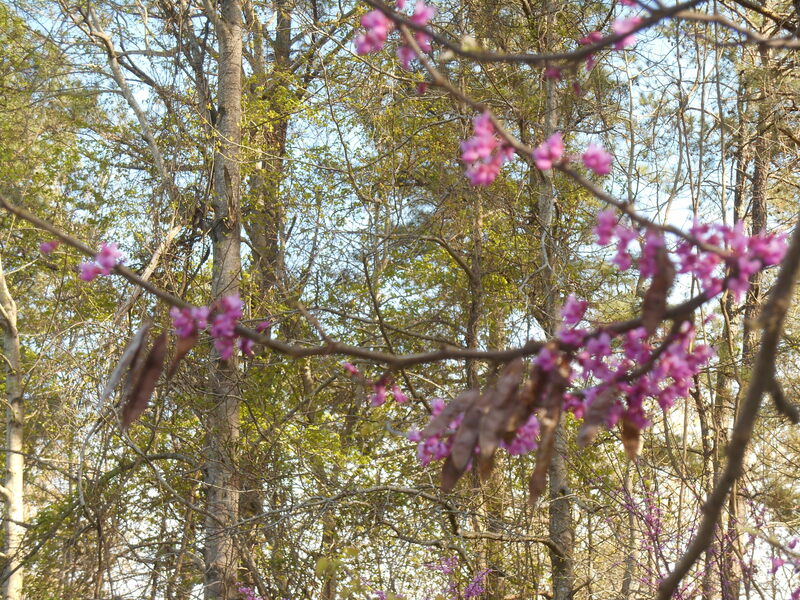 Redbud trees also help improve the soil and nourish other plants. As legumes, members of the pea family, they can fix nitrogen, taken from the air, in the soil around their roots. Their fallen leaves and seed pods also feed the soil as they decompose each winter. 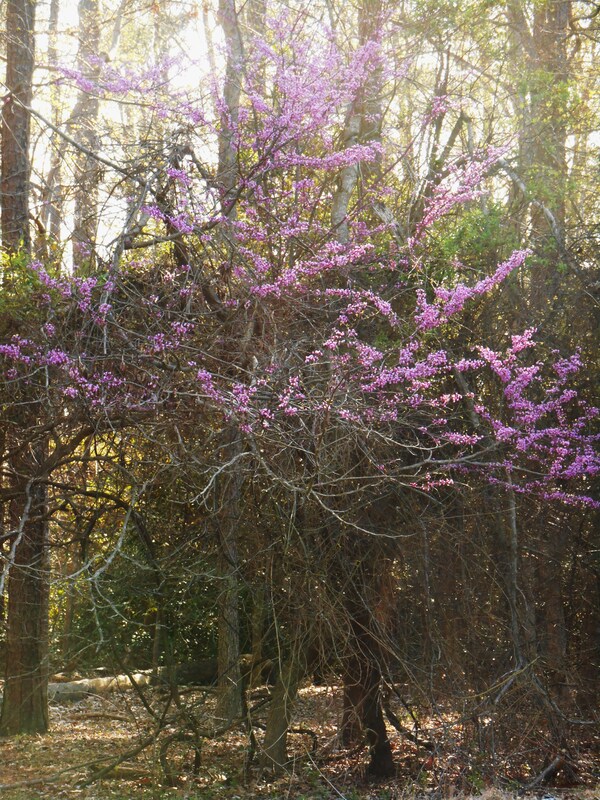 We were happy to find several redbud trees in our garden here. We have one very large old one in the back near the ravine, and several much younger ones along the street. We spot a new one in bloom every year or so, and I’ve planted at least two over the past few years. One was a seedling sprouted in the wrong place, which I moved. The other was a gift, which I grew on in a pot for a few years, before putting it into the ground earlier this spring. Now it has just come into bloom for the first time. 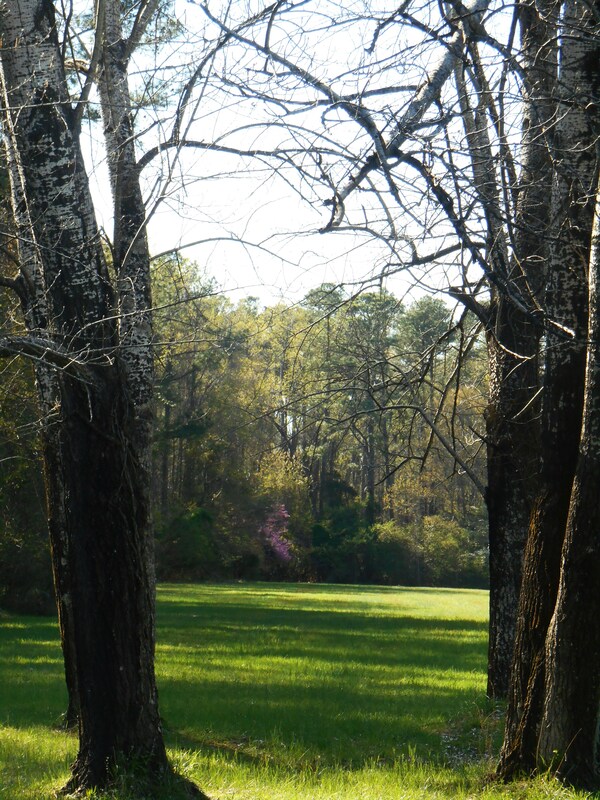 Mid- April, when the redbuds are in full bloom, the Dogwoods are opening, and the Azalea buds have begun to swell, is one of my favorite times of the year. The bare woody bones of winter burst into vivid flowers and cover themselves with tender green leaves. What astounding beauty manifests all around us each April. Redbuds have been available at nurseries here in southern Finland for some time apparently. I’ve seen several in the neighborhood and spot one from time to time while out & about every spring. 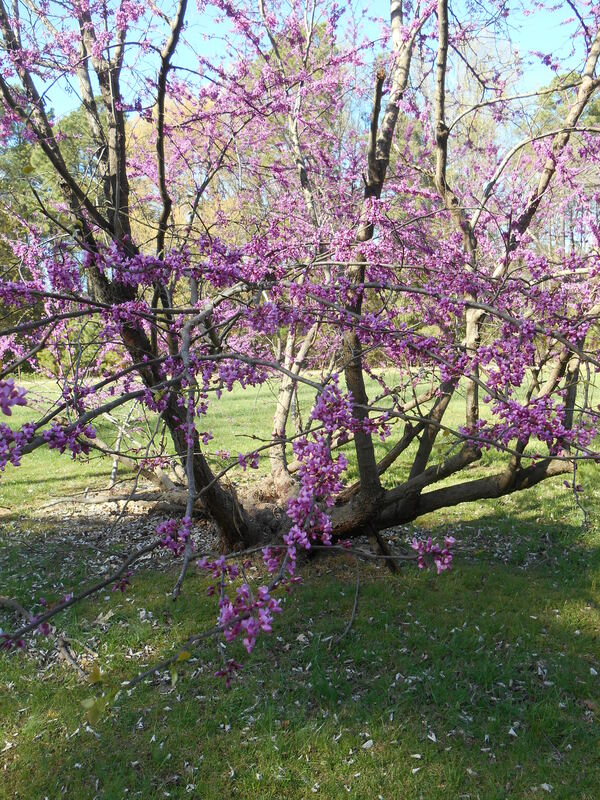 We planted a weeping redbud ‘Lavender Twist’ (Cercis canadensis) last year. Unfortunately, it had already bloomed by the time we purchased it, so we’re really looking forward to seeing it in bloom this year. 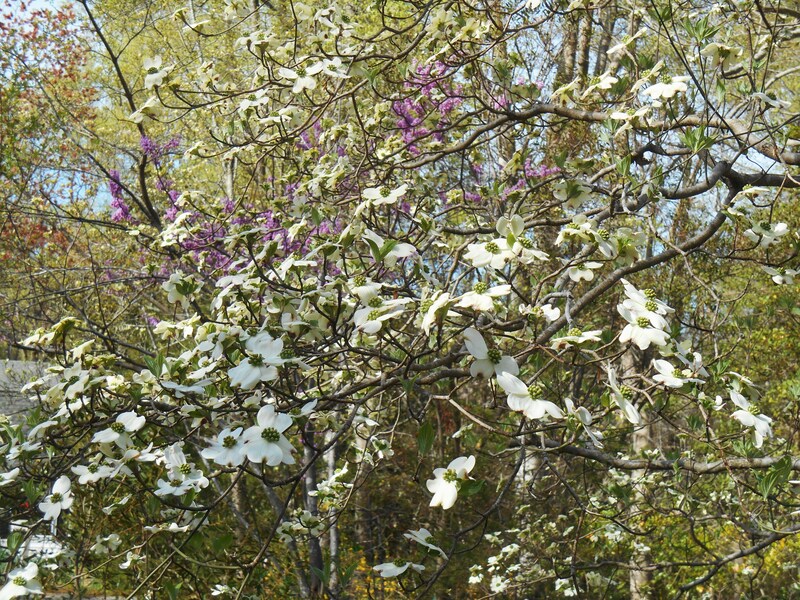 I doubt Dogwood trees would be worth the effort – just too chancy with our winters. Although, Cornus in bush form do exceptionally well. Thank you , Kate , for sharing that Cercis have come to market in Finland ! That’s exciting ! I hope you will enjoy the bloom on your new weeping Cercis this spring. I adore our native dogwood, but you are correct that some of the shrubby Cornus, especially those with colorful new wood , are beautiful as well . Thank you for visiting Forest Garden , Kate ! In late January and February my thoughts often turn to trees. Whether I’m out pruning in preparation for spring, admiring a sculptural tree against the winter sky or planning what trees I’d like to plant in the weeks ahead; I’m thinking of trees. I also hope that you might enjoy a glimpse of spring on this cold and wintery day. Spring is once again on its way, no matter how cold and blustery it may be outside today. As you plan for spring, please also give thought to adding another tree or two to your own garden. The shade it offers during summers yet to come will be your reward. 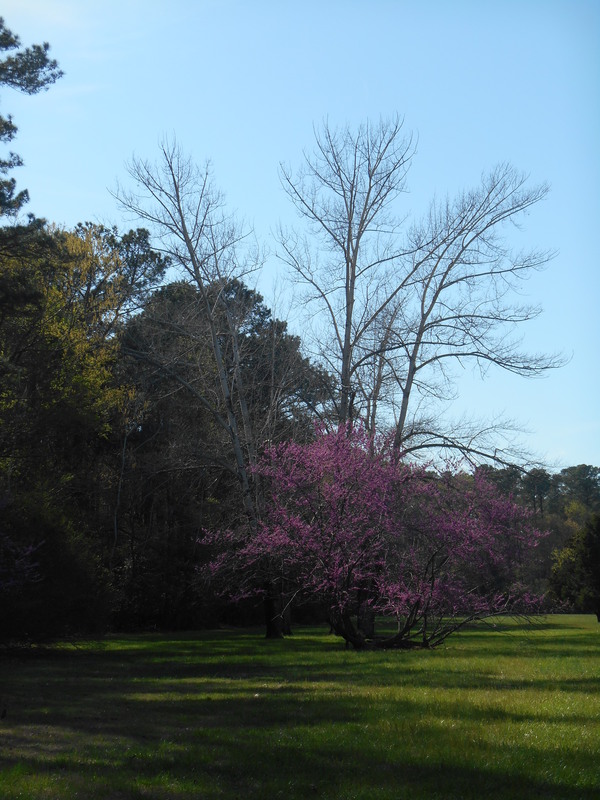 Our redbud came to us as a mere whip from the Arbor Society. I always enjoy the heart-shaped leaves, and this year it is blooming for the first time. The way the blooms sprout straight from the branches surprised me. What fun to acquire all of this extra information. It’s been about ten years. I had all but given up on ever seeing blossoms. Yes, the azaleas are out and OMG, such beauty everywhere! I esp. adore A. atlanticum, so delicate and fragrant. Pure heaven. I feel I’ve been given 2 springs this year – such a treat! A wonderful post. I share your delight in redbuds. This year they seem to be more colorful than ever. 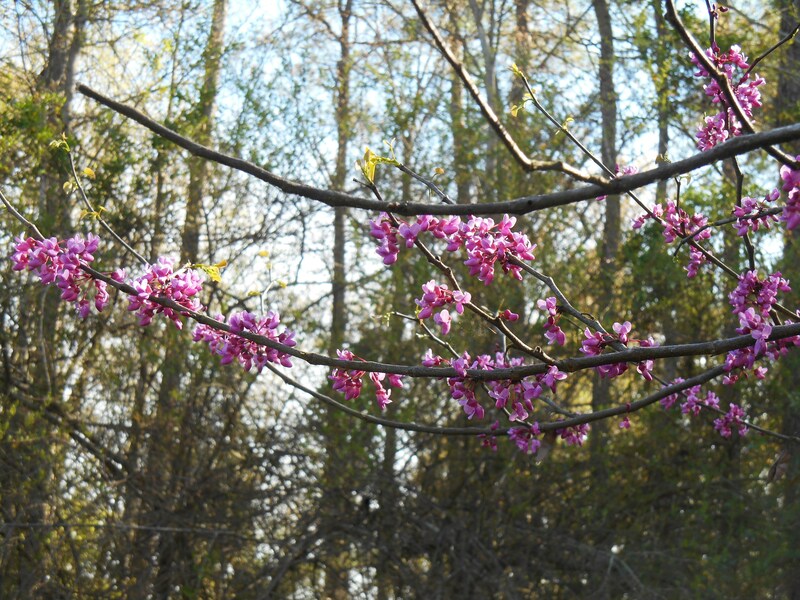 Have you seen ‘Forest Pansy’ redbud? It has dark purple/red leaves with the same wonderful flowers. I had one in my Chapel Hill garden which was beautiful, but just didn’t have the space in my current garden. 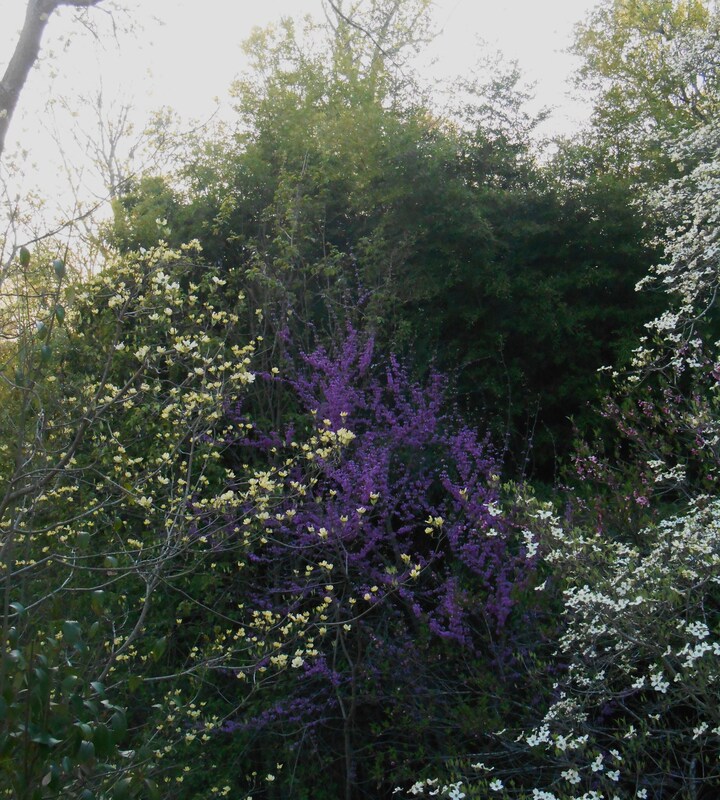 What a fine introduction to the redbud tree. This reminds me of why naturalists fret about the approach of their destiny, . 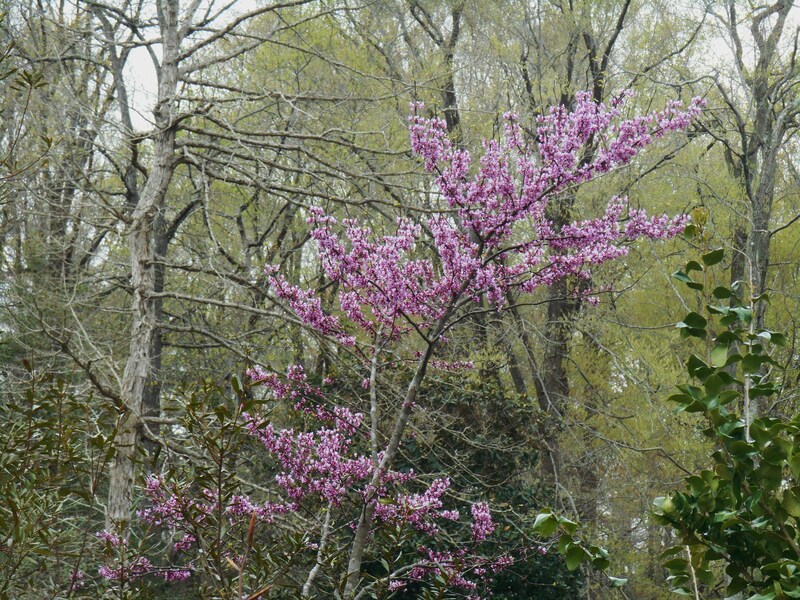 . . they don’t want to contemplate forever missing the beauty and elegance of such springtime blooms . . . .
Oh, if things were turned around, I would have sought that Mediterranean Cercis. The Middle East also had a wet winter, and when I was there March 9-29, there were carpets of bloom everywhere, and I shot quite a few rare to rarer wildflowers. There’s a town in western Penna named Redbud. Good choice of name, No? I have to say again . . . That was a good post, WG. After reading your description I realised these are what we call Judas Trees! Rarely grown here, possibly as they are not reliably hardy enough, and they must be a native Southern European sort here as they are common in the warmer Mediterranean regions. Yes, they are lovely – for so many reasons. Great photos!